The Amazon Buy Box is the prominent white box on the right side of the Amazon product detail page where customers begin their checkout process. When a customer presses the “Add to Cart” or “Buy Now” button in this box, they are buying from the Buy Box winner. In this image, we see that “WorldWide Distributors” won the Buy Box and is an FBA seller. How can you win the Amazon Buy Box? Price Competitively: Aim to price your item within 2-4% of the current Buy Box price. If Amazon is selling the same product, price yours (including shipping) 1-2% below the Amazon price. Seller Ratings: The percentage of ratings that are positive as provided by verified customers. Maintain a seller rating of over 95%. Sending personal emails soliciting feedback after delivery can help improve this score as well as replying to emails from customers within 24 hours. Inventory Depth: How often a seller runs out of stock. Sellers should aim to keep their inventory as full as possible. Refund Rate: How often a customer asks for a refund. Sellers should attempt to keep this rate below 2.5%. Shipping Speed: The time it takes to ship the item. Sellers should try to have an on-time delivery rate above 97% and a late shipment rate of less than 4%. New Sellers: New sellers may need to price their products lower than their competitors to remain competitive and win the Buy Box as Amazon favors experienced sellers in their algorithm. Source the Right Items: Try to source products that Amazon isn’t sourcing and those with very few competitors. Keep Multiples in Stock: Amazon will give the Buy Box to a seller with multiples of an item in stock rather than to a seller with one or few products in stock. Stay on Amazon: Amazon rewards experienced sellers in its algorithm. Be a Pro Merchant: While the Pro Merchant account costs $39.95 per month, a seller is only eligible to win the Buy Box to the extent he is a Pro Merchant. Be an FBA (Fulfilled by Amazon) Seller: Amazon gives the Buy Box to FBA sellers over merchant fulfilled sellers. One should note that the Amazon Buy Box requires the item to be newly conditioned. The one exception to this rule is certain media items where Amazon will have both a new and used Buy Box. Here are the essential basics of the Amazon Buy Box that provide a fuller picture of how it works. Rotates: No third-party seller dominates the Buy Box unless he is the only seller as Amazon rotates it among competitive sellers using its own algorithm. Has competitive prices: The Buy Box price isn’t always the lowest one as sometimes it will be up to a few dollars more than the lowest price. Geography: The Buy Box varies based on location because the warehouses are spread out across the world.This means someone who is looking to buy a iPad in San-Francisco would likely receive his product from a West-Coast warehouse in contrast to another customer in New-York City who would acquire his iPad from an East-Coast warehouse. Amazon Items: Sometimes Amazon will share the Buy Box meaning it will give sellers the option to buy a third-party’s item or Amazon’s product in the Buy Box itself; however, most of the time it will dominate the Buy Box. The Buy Box is responsible for over 90% of Amazon’s product page sales! 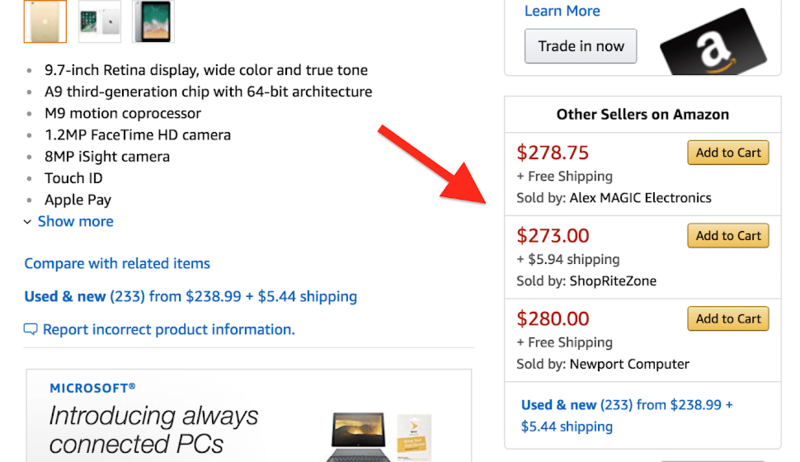 This is because most customers don’t scroll down to search through the “Other Sellers on Amazon”, comparing the Buy Box price with the other sellers prices but rather immediately click the “Add to Cart” or “Buy Now” button. By being the Buy Box winner, a seller benefits from being the default seller and will enjoy most of the sales of this specific product. In this image, we see the “Other Sellers on Amazon” box. Now that you have a deeper understanding of the Buy Box and how you as a seller can increase your chances of being the coveted Buy Box winner, it is time to start selling smart! Using Algopix, start searching products you suspect will be Buy Box eligible and Algopix will provide you with data like the product demand level, estimated profit, and competition level in order to make informed business decisions. This data combined with your newfound knowledge of the inner workings of the Amazon Buy Box will help you source only the most profitable products.